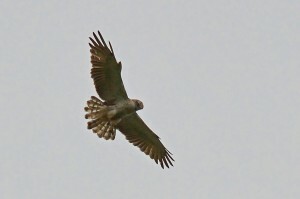 We were glad to see that the Short-toed Eagle returned to Ashdown Forest for another tour around. A number of the group managed to see it, others unfortunately dipped, although there’s nothing to say it won’t hang around or come back again! At around 13:30 it was circling and looking for a meal over Gills Lap and Wrens Valley, then slowly it drifted over Old Lodge. It’s not every day the Forest gets a mega rarity like this, let alone twice!